Forward 28 cm turrets of Scharnhorst. U.S. Naval Historical Center Photograph # NH 101571. This weapon was used for the small battleships Scharnhorst and Gneisenau and was an improved version of the 28 cm SK C/28 gun used for the Deutschland class Panzerschiffes. The high muzzle velocity of this weapon gave its relatively light-weight projectiles long range and good penetration power against belt armor, at a cost of relatively poor performance against deck armor. Scharnhorst made one of the longest hits ever scored by a naval gun on an enemy ship when she struck the British carrier HMS Glorious at approximately 26,465 yards (24,200 m). See the Technical Board essay Longest Gunfire Hit for further details on this action. It had been originally planned to regun the Scharnhorst class with 38 cm guns and then use the surplus 28 cm turrets to arm the first three of a new generation of Panzerschiffes, the "Kreuzer P" class. Additional guns and mountings were to be built to arm additional units of this class. However, all these plans were abandoned at the start of the war. 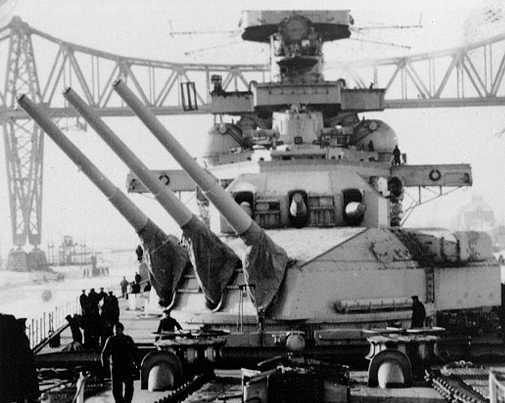 When Gneisenau was badly damaged during a bombing raid, her guns were then used for coastal artillery emplacements. Turret Caesar still remains as a museum exhibit at Austrat (Batterie Oerlandat) which is near Trondheim in Norway. Turret Bruno was used at Fledt, near Bergen. Individual guns from Turret Anton were used in Denmark and the Netherlands. "This 28 cm gun had the same kind of projectiles, more-or-less, as did the guns on the Bismarck and Hipper; the Psgr.m.K. L/4,4 AP rounds, scaled to the 28.3 cm size from the 38 cm and 20.3 cm size, respectively. 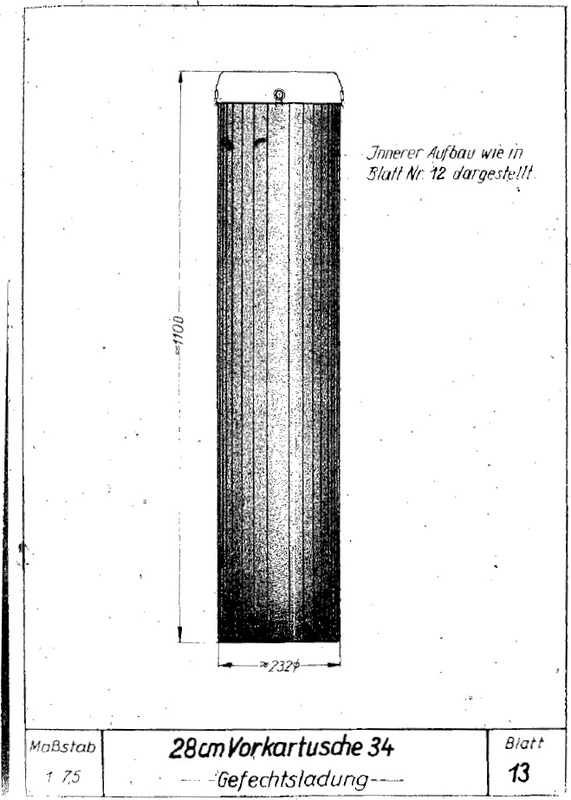 The 28 cm SAP round was similar to the 38 cm round, but the 28 cm size did not have the light AP cap used with the 38 cm projectile. 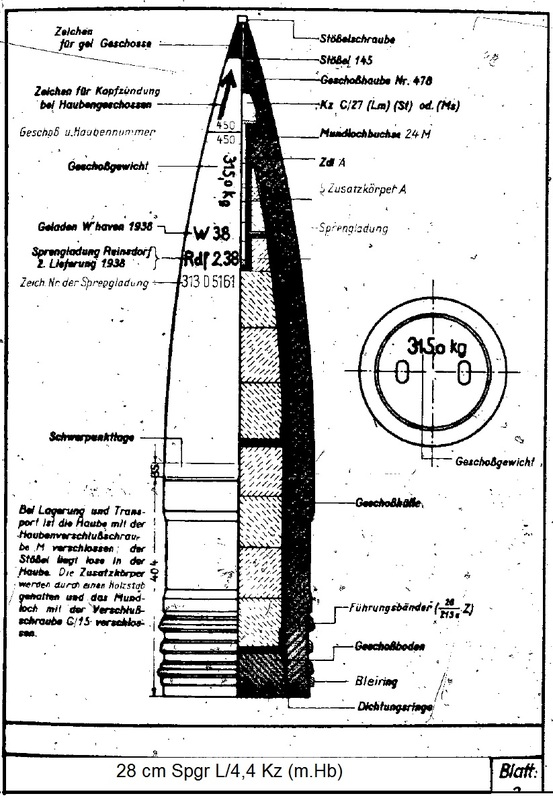 This was perhaps because the Germans knew that the French were using KC armor for their new BB and BC turret roofs, so the Germans designed their 38 cm SAP projectile to defeat this armor at long range, reserving the 38 cm AP projectile for closer ranges where penetration of the main side armor was possible. A 28 cm SAP design of this kind would be too small to penetrate this kind of armor." -- Nathan Okun. Constructed of A tube, loose liner, two-part shrunk-on jacket, a breech end piece was screwed on hot to the jacket, and a breech block supporting piece was screwed into the breech end-piece. The breech block was a horizontal sliding type. The Netherlands Navy planned to use a very similar 28 cm gun for their never-built "Design 1047" Battlecruisers. ^Both the HE L/4,4 Base Fuze and the HE L/4,4 Nose Fuze used a ballistic cap (windshield). 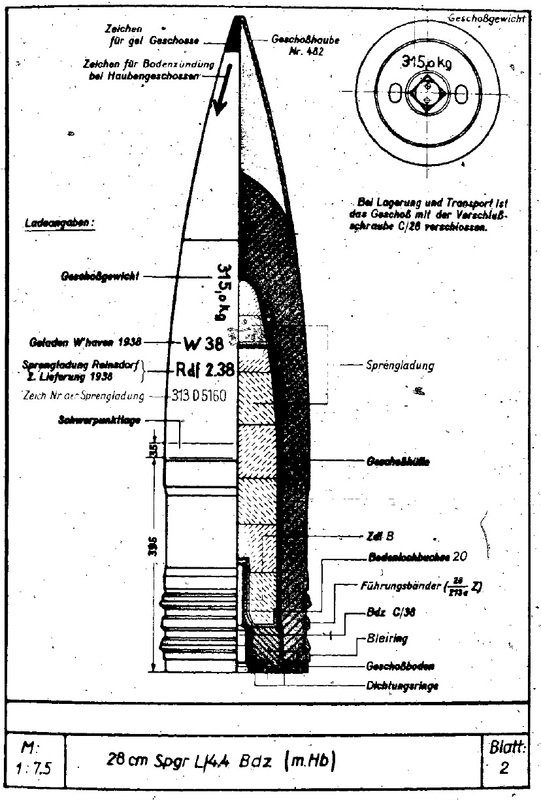 ^German HE Nose Fuzed projectiles with ballistic caps had a rod between the nose of the shell and the fuze to improve performance when striking obliquely. See details on 12.7 cm SK C/34 datapage. ^As of the 1939 publication date of M.Dv. Nr. 170,47, no AA version of the HE L/4,4 nose fuze was in service for these weapons. 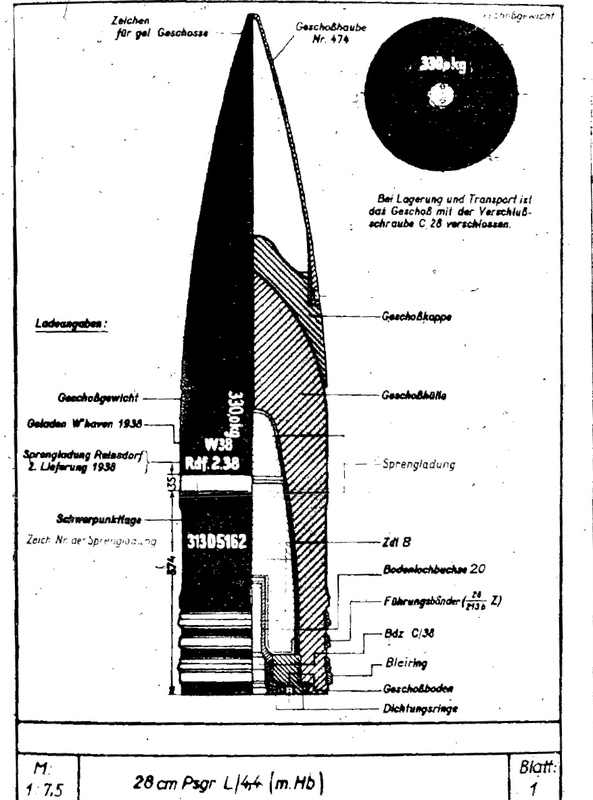 However, the post-war USN NAVTECMISEU Technical Report #191-45 "Standard German Projectile Fuzes" lists the time fuze Z.Z. S/60 nA as being used on the 28 cm Spgr. L/4,4 Kz (m.Hb) which implicitly means that sometime during the war an AA version of this projectile was issued. Most likely, this projectile was similar to that for the 15 cm/60 (5.9") SK C/25, see the sketch at the bottom of that datapage for details. The designation for these AA rounds was probably 28 cm Spgr. L/4,4 Kz (m.Hb) – Haube abgeschraubt - 28 cm HE L/4,4 Nose Fuze - Unscrewed [Ballistic] Cap. ^These guns, like most large caliber German guns, used a "fore charge" which was propellant in a silk bag, and a "main charge" which was propellant in a brass case. The brass case helped to seal the breech of the gun. ^Fore and Main charges were rammed together. 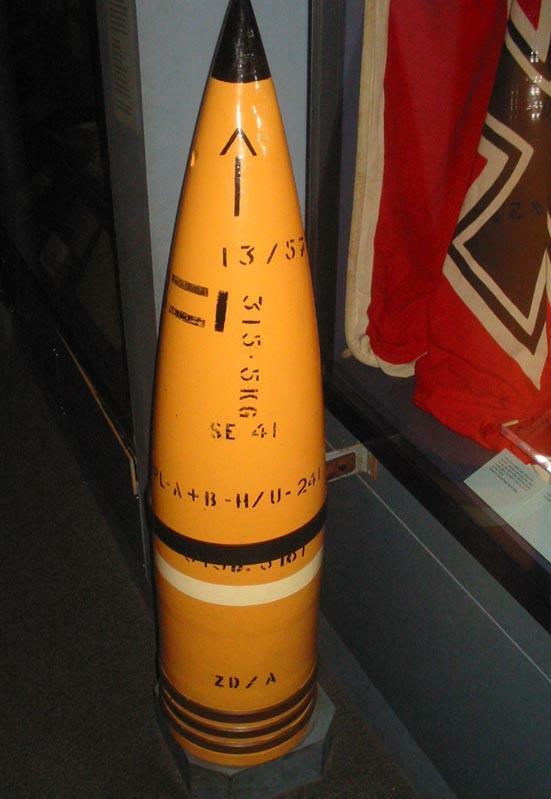 ^Fore Charge: RPC/32 was used earlier in the war and these had propellant loading of 91.5 lbs. (41.5 kg). See sketch below. ^Main Charge: RPC/32 was used earlier in the war and these had propellant loading of either 164.9 lbs. (74.8 kg) or 170.2 lbs. (77.2 kg) depending upon the grain size. See sketch below. ^This is the design figure. "German Warships 1815-1945" says that the actual outfit ranged from 105 to 150 rounds. APC and HE ballistic caps had a radius of 10 calibers. The above information is from "Battleships: Axis and Neutral Battleships in World War Two" for a muzzle velocity of 2,920 fps (890 mps) and is based upon the USN Empirical Formula for Armor Penetration. The above information is from "German Capital Ships of World War Two." The data is based upon the pre-war Krupp test shoots on their range in Meppen with L/4,4 APC projectiles using RPC/32 propellant against KC-type armor at an impact angle of 70 degrees. It should be noted that RPC/32 propellant was replaced by the more powerful RPC/38 type which was the only propellant used in World War II. ^The first three units of the Kreuzer P class were to re-use mountings from the Scharnhorst class after those ships had been rearmed with 38 cm SK C/34 guns. 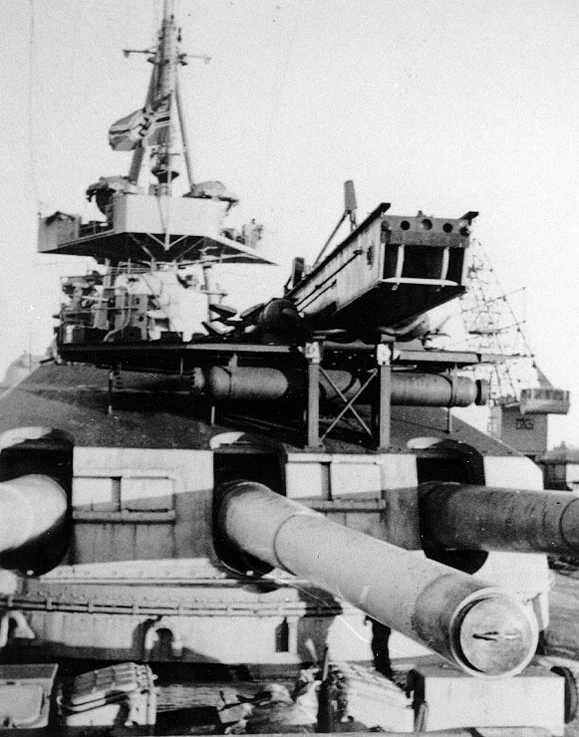 Other proposals saw new three-gun mountings being built that reverted to the same level of armor protection as those in the Panzerschiffes. In May 1939 plans were made to complete twelve of these ships between 1943 and 1948 but none of them were actually laid down. 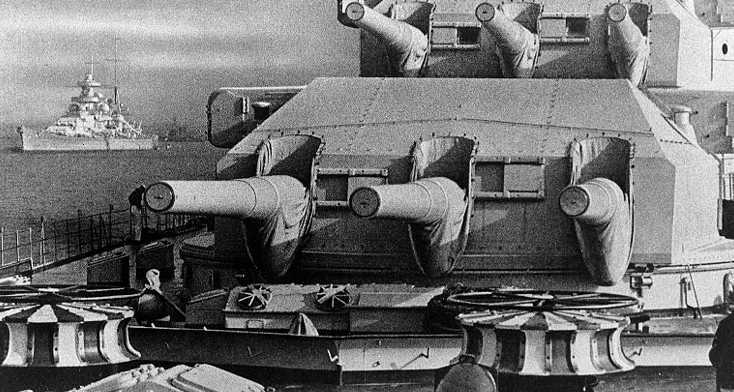 In general, these mounting had similar ammunition handling to that used for the Panzerschiffes with some differences to accommodate the larger projectiles. The center gun fired first followed by the wing guns 10 to 20 milliseconds later in order to reduce shell interference. Aft 28 cm turret of Scharnhorst showing aircraft catapult. U.S. Naval Historical Center Photograph # NH 102536. Forward 28 cm turrets of Gneisenau. Ship in left background is Scharnhorst. U.S. Naval Historical Center Photograph # NH 97538. 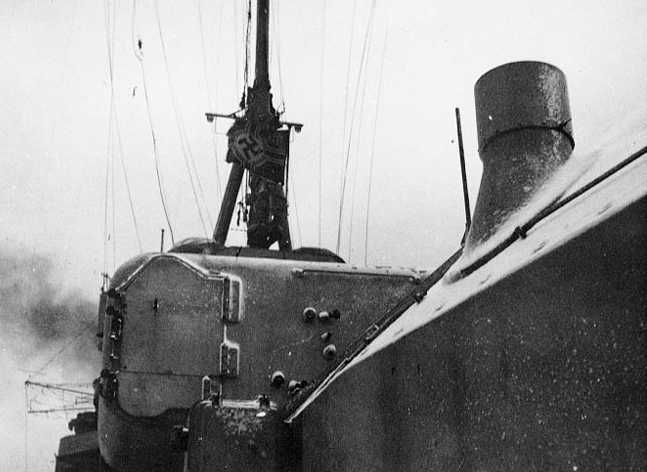 Close up of rangefinder on after turret of Scharnhorst during the winter of 1939-40. U.S. Naval Historical Center Photograph # NH 102531. German 28 cm Spr.gr. L/4,4 Kz (m.Hb) now at HMS Belfast Museum in London, UK. Photograph copyrighted by Vladimir Yakubov. 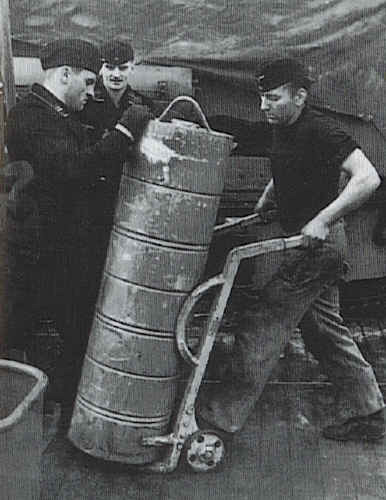 Crewmen move 28 cm charge container on Scharnhorst. 28 cm APC projectile. Sketch from M.Dv. Nr. 170,47. 28 cm HE Base Fuzed projectile. Sketch from M.Dv. Nr. 170,47. 28 cm HE Nose Fuzed projectile. Sketch from M.Dv. Nr. 170,47. Fore Charge (Vorkartusche) for 28 cm SK C/34 gun. Propellant weight for RPC/32. Sketch from M.Dv. Nr. 190,4A6. 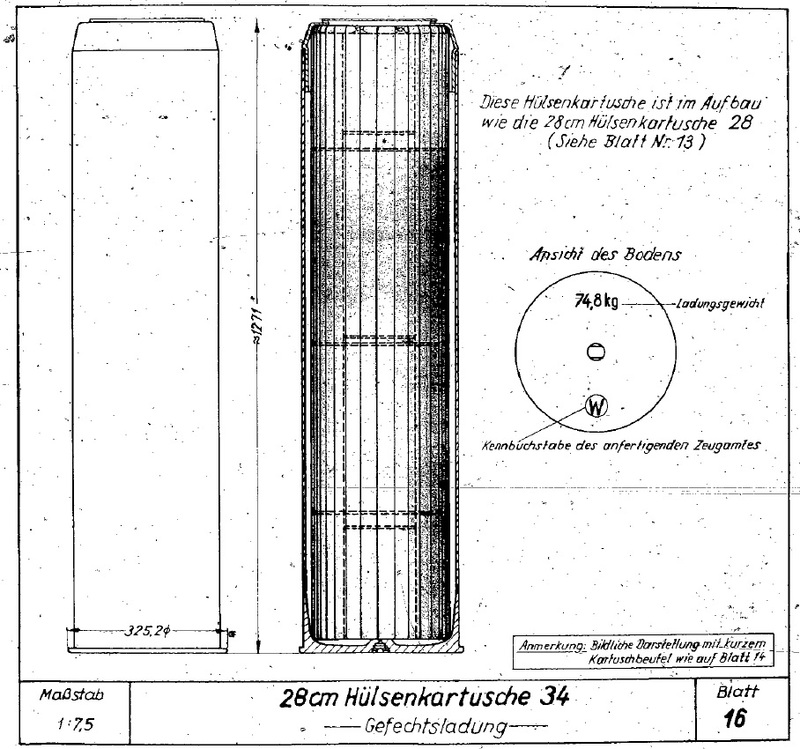 Propellant casing (Hülsenkartusche) for 28 cm SK C/34 guns. Propellant weight for RPC/32. Sketch from M.Dv. Nr. 190,4A1.